The nation is still frantically searching for the right metaphor for Bobby Jindal's sing-songy southern-inflected speech that seemed better suited for heavily sedated school children than a live national audience. While the rest of the world (yours truly included) went for the easy Kenneth The Page call-out, Jon Stewart more thoughtfully invoked Mr. Rogers. We even had a mini-Kenny backlash as actor Jack McBrayer went on the Late Show to not very convincingly dismiss the similarity. But there is another pop cultural icon out there that fits that overly proper and slightly clueless demeanor. That would be none other than popcorn pitchman Orville Redenbacher. Update: Famous 'reasonable conservative' blogger Jon Swift took me to task for the Kenneth Parcell comparison impugning that comparing a person of South-Asian ancestry to a cracker comedian might be racist, so I have also added his choice of Dev Patel, the star of Oscar-winning feel-good movie of the year Slumdog Millionaire. And may the best caricature win. I think race is a red herring in this situation. 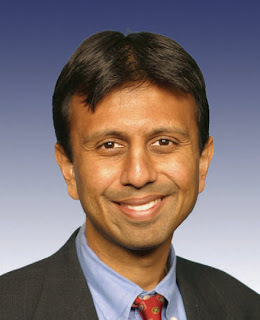 Jindal obviously looks most like Orville. Well spotted! Yesterday after I did a library story time for toddlers someone told me my delivery reminded them of someone: Bobby Jindal. I'd be insulted but they didn't say I reminded them of Jindal in general - just my way of leading toddlers in song.